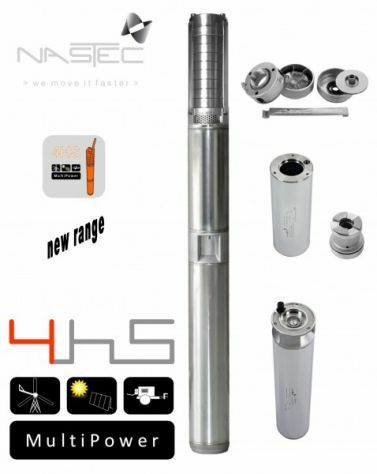 NASTEC 4HS MP MultiPower pumps can be powered by renewable energy sources. 4HS MP pumps may be powered by AC or DC with a wide range of operating voltage (90 - 265 VAC / 90 - 340 VDC) this enables 4HS MP pumps to be connected to solar panels, batteries, wind turbine and diesel generator. 4HS MP pumps are available in both Multi-Stage Centrifugal and Progressive Cavity type designs.